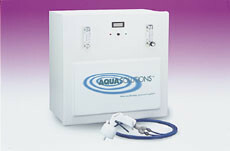 Aqua Solutions Inc., of Jasper, Ga., offers Type I laboratory water purification systems that conveniently and reliably produce Type I reagent grade water directly from ordinary tap water as well as pretreated water. Depending on the model, a system can contain from two to five times the ion exchange capacity of competitive systems, thereby substantially reducing the cost of purifying water. Because of this, most systems can operate for up to one year before replacing the purification kit or DI modules.